Found beachside in Tangalle, The Last House is a stunning tropical home with six bedrooms, colourful spaces, a private swimming pool, and verdant gardens. Close to many amazing sights on the southern coast of Sri Lanka including whale and dolphin watching, turtle hatcheries, etc. the villa is ideal for families travelling for a get together. If you’re travelling with kids even better since they can truly enjoy themselves in this paradise. 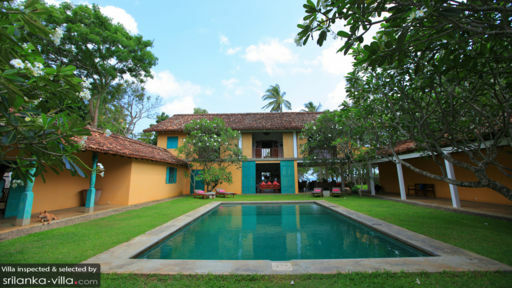 A traditional Sri Lankan home with ochre walls and red, shingled roof, the villa is a comfortable and homely space for guests to relax in. With five bedrooms, The Last House is the ideal family-friendly holiday home. Two bedrooms are tucked away in the Cinnamon Hill Suite with one double bedroom and twin room. This is perfect for those travelling with kids as it makes for a comfortable family suite. The compound leads to a private terrace or balcony offering spectacular sea views and a lounge area for some lovely moments in the evening. The remaining three bedrooms – Moonamal, Atteriya, Na – are also sea facing bedrooms and also provide panoramic views of the garden at the villa. Each of these bedrooms boasts an en-suite bathroom for convenience. 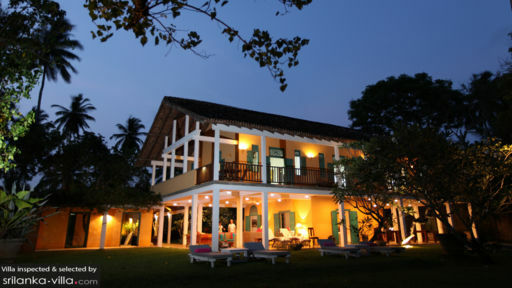 The bedrooms have been designed in traditional Sri Lankan style with slanted, thatched ceilings, brightly-coloured furniture, and canopied beds. Surrounded by manicured gardens is the free-size swimming pool at The Last House, a refreshing and rejuvenating part of the villa where you can spend hours splashing around and swimming with friends and family. There are sun loungers that you can relax on and work on getting a holiday tan or even enjoy a view of the cotton candy skies. You will also find plenty of outdoor seating options around the patio, perfect for the morning when you can relish the sounds of nature while sipping on your tea or coffee. At The Last Houses, guests will be greeted by an open sided living area that overlooks the luscious gardens and pool area. Designed in the most vibrant style, the living room features shades of red, yellow, blue, and pink, a pastiche of colours for a bright space. Comfortable and traditional seating makes for a relaxing nook where everyone can spend time together. There are lounge chairs that sit facing the garden so you can bask in the views on offer. 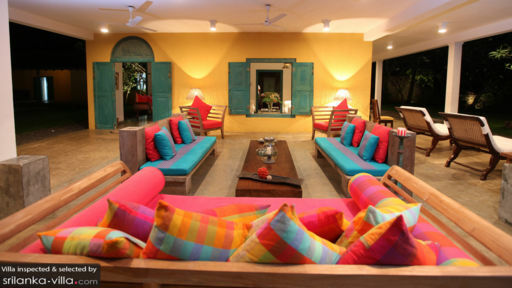 The dining area is a festive affair surrounded by tropical flora, plentiful views, and a constant supply of fresh air. The dining table is large enough to accommodate everyone so you can relish a hearty meal together. There is another living area with plush sofas, a bookshelf etc that leads directly to the pool as well. Guests are free to use the fully-equipped kitchen as well. The Last House extends professional services of its staff with housekeeping, security, and management to look after your needs and requirements. Guests can hire a personal chef for your meals, and a daily breakfast is complimentary to your stay. For in-house massages, guests can always make requests as it comes at an extra cost. The villa is located beachside with easy access to sandy shores and you can always visit Mirissa beach which is an excellent spot for whale and dolphin watching. National parksare in abundance in Sri Lanka, so go out and discover the thriving wildlife of the island.